The Substation - Sungei Road Market: A future for street culture heritage? 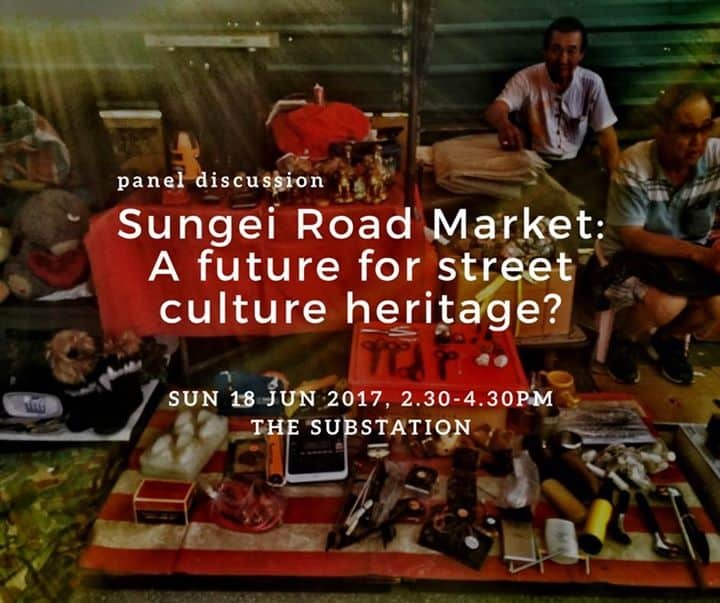 Home / Event / The Substation – Sungei Road Market: A future for street culture heritage? The Substation – Sungei Road Market: A future for street culture heritage? Does an organic street market like Sungei Road Market have any place in modern Singapore? On 11 July 2017, Sungei Road Market will be shut down after over 80 years as a secondhand market. With more than 200 vendors, it is the city’s largest collection of flea market stalls, and is Singapore’s only permanent outdoor market and the only free hawking zone where no licences or stall rentals are required. Since the announcement of its impending closure, many Singaporeans of all ages have been expressing their feeling for the Market, in their blogs and social media, through photography, video and art projects, as well as signing petitions. This panel discussion will explore what Sungei Road Market means in terms of social memory, tangible and intangible heritage, public space, urban life, modernity, as well as ways of envisioning the future for Singapore’s street culture living heritage. Tay Kheng Soon is an Adjunct Professor of Architecture at NUS, convenor of the Future of Singapore Forum (FOSG), a fellow of World Academy of Art and Science, a founding Member and Chairman of the Singapore Planning and Urban Research Group (SPUR, 1970-1971); Chairman of The Substation; and a past president of the Singapore Institute of Architects (1991-1993). Laavanya Kathiravelu is an Assistant Professor at the Division of Sociology, Nanyang Technological University, Singapore. She is interested in issues of urban diversity and migration, in Singapore, but also other parts of Asia, Africa and the Middle East. The aspect of Singaporean heritage she values most is its amazing food. Faiz Bin Zohri is a practicing landscape architect driven by the interconnections of autonomous public spaces, landscape traditions, re-generative ecologies, and ideas of a “discontinuous” unity. He also runs and presents Street Reports, observations of street objects and structures that spontaneously and temporarily adapts to everyday street issues. He volunteers for the Save Sungei Road Market initiative. The Substation Theatre, 45 Armenian Street.